When I still lived in Chicago, a friend’s family had a tucked-away lake house across the Indiana-Michigan line on the southeastern shore of Lake Michigan. Escaping our humid, cramped city apartments for beer- and barbecue-fueled lakeside debauchery was a summer highlight—we lit fireworks, jumped off docks, dared each other to swim the length of the lake at midnight. I was always game for these adventures, but mostly because the drive to Michigan meant a potential stop at Local, a now-closed butcher shop in New Buffalo. There, bacon jam awaited. This butcher shop’s bacon jam was so coveted, supplies were quickly depleted during summer tourist season. If bacon jam was still available, the owners flew a flag above the shop’s sign. The flag read, in big block letters: BACON. That flag made my eyes mistier than they’ve ever been over the stars and stripes, honestly. On grilled burgers, there’s no better topping than bacon jam, whether homemade or store-bought—not even bacon itself. Strips of bacon are delicious with breakfast, but on a burger, they slip-slide off the patty, or become dislodged from the burger, forcing you to eat the strip on its own. Bacon jam solves the issue, staying distributed evenly across the burger, soaking slightly into the bun, melding harmoniously with cheese. 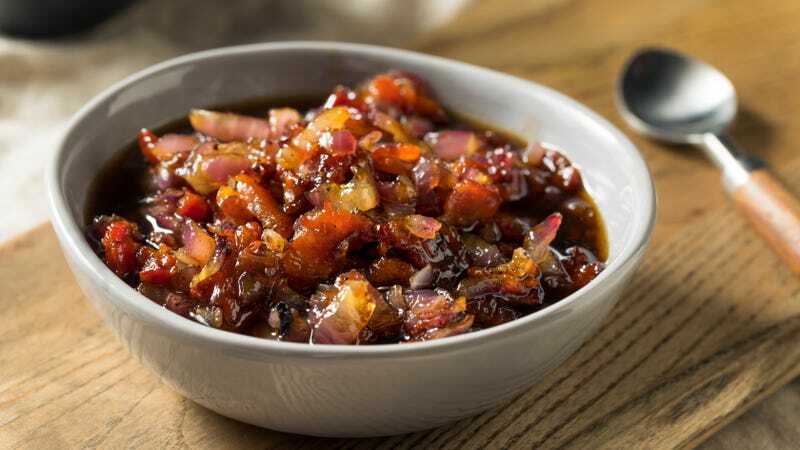 Bacon jam also has a sweet, caramelized-onion corona to its savory center, something strips of bacon can’t match. Unless of course, you’re using candied bacon atop your burgers, in which case, just make bacon jam. The interplay of onions and brown sugar and bacon and spice really is greater than the sum of its parts, and it takes the place of nearly all other condiments on your burger, an all-in-one sauce that delivers every flavor a burger needs. Use The Takeout’s easy recipe below, or experiment with tweaking the ingredients to your heart’s desire. Don’t forget, it’s not just for burgers, either. Spread it on turkey sandwiches, dollop as a pizza topping, slather it on corn muffins, but above all—make it for your next burger night. Dice bacon (easier to dice if placed in freezer for 20 mins). Fry bacon in skillet until slightly crispy. Remove bacon and set aside. Take out half the bacon drippings from skillet. (Save it!) Add sliced onions to bacon pan and sauté for 15 minutes until soft and yellow. Remove excess liquid. Add back cooked bacon, along with brown sugar, coffee, vinegar, Worcestershire sauce, sriracha, and mustard. Bring to boil, then lower heat to simmer. Stir occasionally for next 30 minutes. Let cool and store in jar. Keeps for one week.